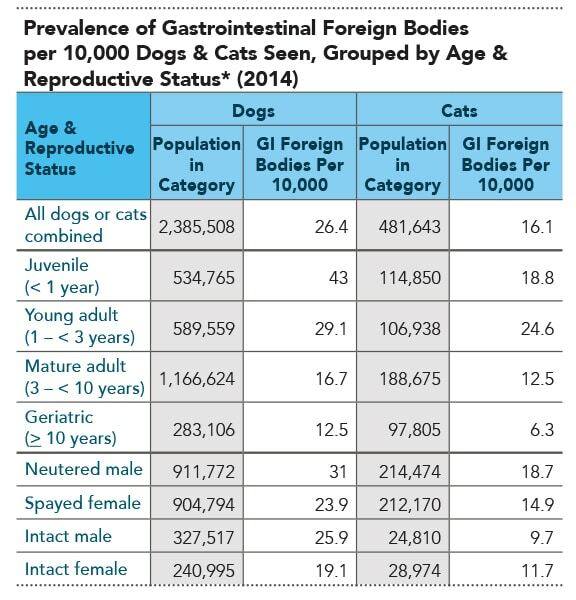 The following tables outline the prevalence of gastrointestinal (GI) foreign bodies in dogs and cats presented to Banfield Pet Hospitals in 2014. 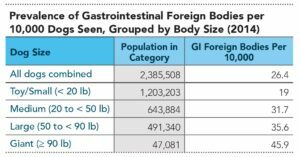 Removal of gastrointestinal foreign bodies is discussed in Endoscopy Essentials: Endoscopic Foreign Body Retrieval. 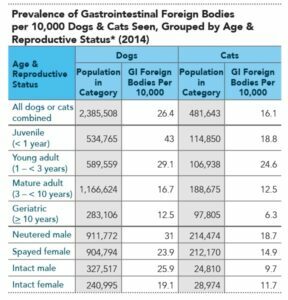 Path to Pet Wellness: These data from Banfield Pet Hospital represent the largest survey performed of the incidence of gastrointestinal foreign bodies (GIFBs) in dogs and cats. 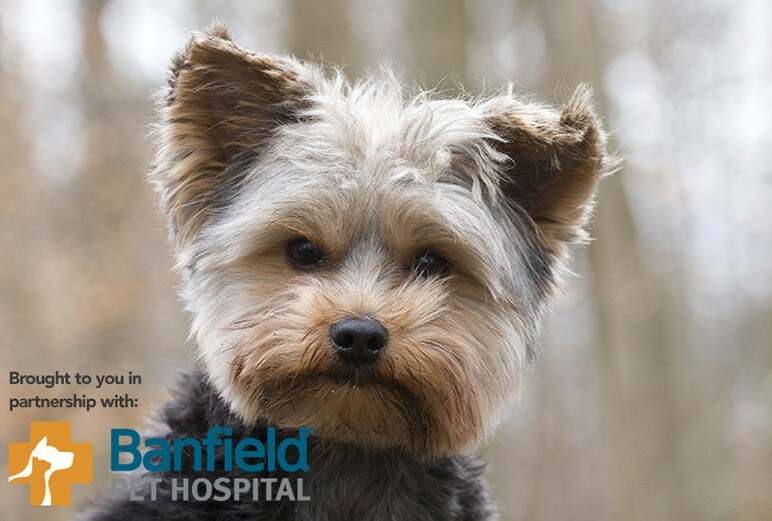 As most small animal practitioners would suspect, younger dogs (< 1 year of age) have the highest prevalence of GIFBs. Interestingly, the age range with the highest prevalence in cats is slightly older than their canine counterparts (1–3 years of age). 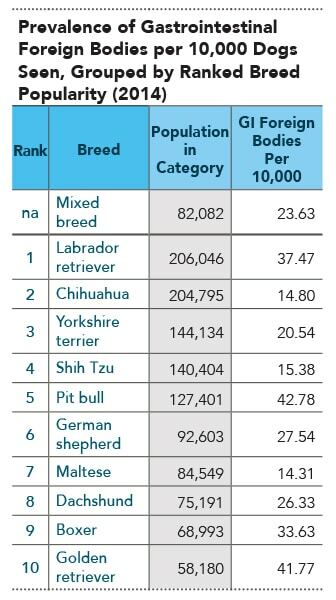 Somewhat surprisingly, pit bulls win out in the breed category (42.78/10,000 dogs seen) over Labrador retrievers (37.47/10,000 dogs seen). 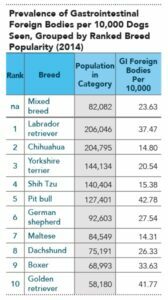 The incidence of GIFBs in dogs parallels their size, with giant breeds having the highest incidence and toy or small breeds having the lowest incidence. I would speculate that larger breed dogs may be able to ingest items, such as cloth, socks, or toys, that smaller dogs are not able to swallow. It is important to note that GIFBs occurred in dogs and cats of every age and size; therefore, this diagnosis should be considered a possibility in any dog or cat presenting for vomiting. These data do not distinguish the location of the foreign bodies in the GI tract, but one previous study reported that 63% of canine GIFB obstructions occurred in the jejunum.1 A thorough history and physical examination, including abdominal palpation, is indicated in animals presenting with vomiting to guide further diagnostic testing, which might include plain and possibly positive contrast abdominal radiographs or abdominal ultrasound. 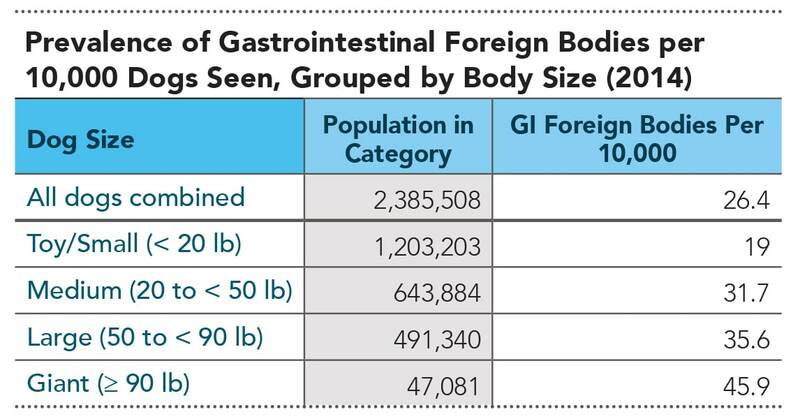 Hayes G. Gastrointestinal foreign bodies in dogs and cats: A retrospective study of 208 cases. J Small Anim Pract 2009; 50:576-583.